High School seniors Alejandro, Silvia, and Aldo, like most of their friends, are eager to go to college and pursue their education. However, their home state of Georgia not only bans them from attending the top five public universities, but also deems them ineligible for in-state tuition at public colleges due to their immigration status as DACA (Deferred Action for Childhood Arrivals) recipients. In response, these three ambitious and dream-filled students divert their passions towards the fight for education in the undocumented community. As President Donald Trump’s campaign rhetoric against immigrants gains momentum, and amid constant threat of losing their DACA status and being deported, The Unafraid follows these inspirational members of the generation of “undocumented, unapologetic and unafraid” young people who are determined to overcome and dismantle oppressive policies and mindsets. Our marchers make a difference. The 3rd Annual Women’s March will continue to empower our global community in support of civil rights, disability rights, ending violence, environmental justice, immigrant rights, LGBTQIA rights, reproductive rights, and worker’s rights! This peaceful demonstration will magnify the work being done by community organizations, and we invite you to join millions in creating another tidal wave that will bring #TruthToPower! Women's March San Diego would like to express our gratitude to the Kumeyaay people, on whose land we march, for their support. 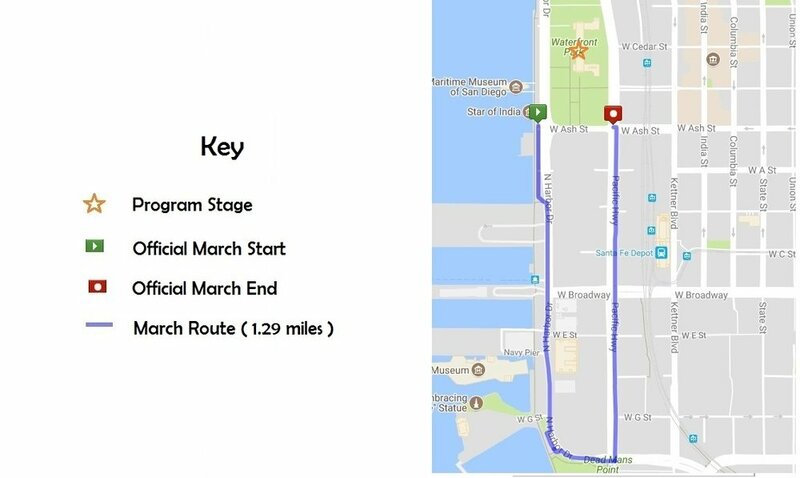 The 2019 San Diego Women’s March will run from approximately 10am – 1:45pm. 10am Blessing and Performances, 11am Speakers, 12pm WE March! Post march, we invite you to return to Waterfront Park to enjoy music by the Resizters, food trucks, and connect with our community partners. For more information regarding the 2019 Women’s March San Diego Program, please click here. Please check back often as we add more speakers! N. Harbor Drive & Pacific Highway will have limited access to traffic from 8:00 am - 2:00 pm. 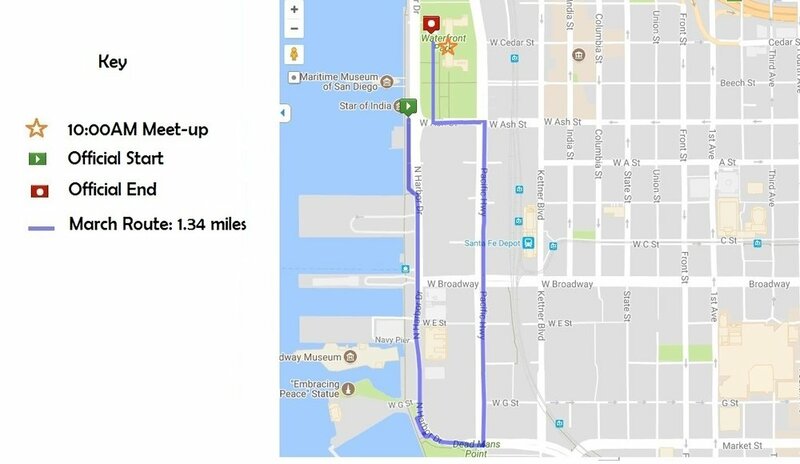 Lyft/Uber/Chartered Bus Drop-off: Beech St. and Ash St. between Columbia & Front St.
March starts and ends in Waterfront Park. 1. COASTER: The COASTER will be running this year, and in support of the march they have added two additional trains! There will be an extra southbound COASTER leaving Oceanside Transit Center at 9:00 AM (making all stops) which will arrive downtown at approximately 10:10 AM, and a northbound COASTER (making all stops) leaving Santa Fe Depot at 2:15 PM. 2. AMTRAK: Link to timetable for Amtrak Pacific Surfliner. 3. SPRINTER: Passengers on all SPRINTER trains must have the appropriate fare. One-way and round-trip tickets can be purchased at the station ticket vending machines, and day-passes can be purchased ahead of time via the North County Transit District mobile app, Compass Cloud. 5. PARK & RIDE: Park at SDCCU Stadium (formerly Qualcomm) and catch the trolley. MTS has 5,000 free parking spots. Compass Cloud mobile ticketing app is the fastest option to get Trolley passes in advance. Exit at the County Center/Little Italy Station. 7. HOP ON A RALLY BUS: Travel on a high-end bus without hassles of driving, parking or navigating traffic. As long as 30 or more people sign-up for a bus, it will run. Rally Bus organizes buses based on demand, so spread the word and help get those seats filled! $35 round trip. 8. PARK DOWNTOWN: Search for and reserve parking in downtown San Diego. Rain or shine, hot or cold...we march! Please check the weather report and please be sure to dress appropriately. We look forward to another peaceful and safe march this year! Since the inaugural march, WMSD has partnered with SD law enforcement and emergency response in order to address marcher safety. We acknowledge that not all members of our community feel safe among law enforcement, and that is why WMSD has a team of marshals (wearing bright pink vests) who are trained in de-escalation. Interested in being a WMSD Community Partner? Women’s March San Diego invites local non-profits and other organizations to join this event with informational booths. All applications will be reviewed and you will be informed via email if your application has been accepted. Click here. Our sisters, North County San Diego Women In Solidarity are hosting a rally in Oceanside and then joining us to march. Lots to celebrate in North County where women are rising up and reclaiming power! For more information, click here. Rally to march in San Diego! We have many victories to celebrate because we’ve worked hard and our efforts paid off. Gather at the Civic Center to get pumped up from our newly elected women as we honor the voices of North County. We’ll also have great music and entertainment to send us off together as a powerful force for the future. We have music and Zumba is back! We have some great speakers to inspire us to reclaim our power! Don’t miss the speakers at 10 am. Then at 10:30 we will march to the train station together to march in San Diego! At the rally we will sell our cool T-shirts in navy blue with our logo at front, 100% Cotton, V neck, Short Sleeved. Priced at $20 each and unisex sizes come in M, L, XL and XXL. Watch out 2019! Here Come The Women! Join the Women's Museum for a panel discussion on the impact women organized protests have had on the history of the United States and how to turn one day into a movement that changes policy and society. The Women’s March is quickly approaching; and NOW is hosting a sign making event! There are a number of reasons why we march, and continue to march and showcasing that on a sign is what this event is all about. Feel free to bring a friend, bring a few! Women’s March San Diego, in partnership with Cinepolis Luxury Cinemas, invites you to join us for a special evening with Producer/Director Linda Goldstein Knowlton as she shares a sneak peek of her new documentary - RADICAL BROWNIES, which follows a group of young girls of color based in Oakland, California driven by a mission for equality and social justice. In addition, Linda will present a special screening of MAKERS: WOMEN IN HOLLYWOOD, a documentary highlighting the rise to power of women in the movie industry. The screenings will be followed by a Q&A with Linda. Linda Goldstein Knowlton is an Emmy-nominated filmmaker, working in both documentary and scripted feature films, as well as in television. For her most recent film, Goldstein Knowlton directed and produced WOMEN IN HOLLYWOOD, one of the six, one-hour documentaries for the Emmy-nominated PBS MAKERS: Women Who Make America series. She has also produced/directed SOMEWHERE IN BETWEEN, CODE BLACK, and the award-winning WHALE RIDER. This event benefits Women’s March San Diego. Our thanks to our sponsor Cinépolis Luxury Cinemas for their contribution and partnership. We extend our special thanks to Linda Goldstein Knowlton for giving us this opportunity to share her work that empowers the women and the girls who will grow into the women who march in the future! Unable to attend this event? Still want to make a contribution to Women's March San Diego? Donate here. On September 25th, in partnership with the League of Women Voters San Diego and Be the Vote, Women’s March San Diego will be hosting an event at Stone Brewery at Liberty Station to celebrate National Voter Registration Day. Come grab a free 5 oz. beer when you register to vote or check your voter registration status! Test your civic knowledge through games, enjoy our photo wall and snag lots of fun voter swag! Bring a friend and learn how you can get more involved and make a difference! Join thousands of San Diegans, in solidarity with people around the world, to demand immediate action on climate change. Together we will march to protect our air, water, and land. We will march for our communities, for clean energy jobs, and for the people we love. We will commit to voting for climate champions. In solidarity with all those who are oppressed in our society, we will demand climate justice. 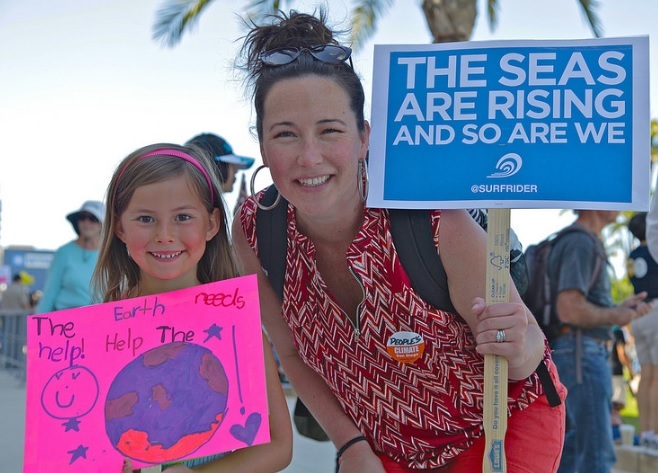 The Rise For Climate March San Diego will gather at City Hall on Civic Center Plaza. Starting at 10 AM there will be live music, inspiring speeches, and participatory actions, followed by a short march to South Embarcadero Park where we’ll have voter registration, activities, and a Kid’s Zone with games and face-painting. Click the following link for more information and transportation options. Join us on June 30, as we join forces with the ACLU, MoveOn, The Leadership Conference, and National Domestic Workers Alliance to send a clear message: Families Belong Together! If you prefer to stay in Waterfront Park, you will be treated to music provided by the Resisterz! It's on us to keep up the pressure. Please join WMSD in solidarity with San Diego Indivisible. Familias Unidas, No Divididas echaza la separación cruel, inhumana e injustificada de niños de sus padres a lo largo de la frontera de los Estados Unidos con México y en otros puertos de entrada a los EE. UU. Protestamos por las condiciones en las que se mantienen a estos niños. Protestamos contra el trauma irreversible que ya se ha perpetrado contra estos niños y sus padres por el delito de buscar una vida mejor. On May 19th, San Diego County voters will join together to collectively participate in the ultimate expression of our democracy...We Will Vote! Bring your mail-in ballot for the June 5th election, and march from the San Diego Civic Center Plaza to the post office in Horton Plaza, where we will show our solidarity in casting our ballots together by mail. This is a significant election for San Diego County. We will elect our District Attorney, Sheriff, and County Clerk and decide which candidates will proceed to the November general election for critical City, County, State, and National races. Need a mail-in ballot? Go to the Registrar Of Voters website. Women's March San Diego has heard the call from our kids, the survivors of the school shooting in Florida who are calling for a march on Washington, and across the country to demand action on gun control. Thoughts and prayers are not enough to honor the victims of gun violence. What we need now is action. On March 24, 2018, students will rally in Washington D.C and in local communities across the country to demand action from our leaders. Join WMSD as we support our students in the March For Our Lives, as we fight for an America that is free from gun violence. Please mark your calendars and plan to join us in solidarity as we support the students on this effort. Details to include location and time are TBD. On January 20th we will march again, this time for our voices and votes to be heard! We will engage and empower our global community to support women's rights, human rights, access to healthcare, social and environmental justice, safety and economic security. This peaceful demonstration will also bring attention to the 2018 elections, magnifying the work being done by community organizations to turn out the vote! For their support, we thank the Kumeyaay people on whose land we march. 1. SPRINTER: In addition to normal Saturday SPRINTER service, four additional trains will run: 8:03 a.m. and 9:03 a.m. departing westbound from Escondido Transit Center, and 9:03 a.m. and 10:03 a.m. departing eastbound from Oceanside Transit Center. Passengers on all SPRINTER trains must have the appropriate fare. One-way and round-trip tickets can be purchased at the station ticket vending machines, and day-passes can be purchased ahead of time via the North County Transit District mobile app, Compass Cloud. 2. PARK & RIDE: Park at SDCCU Stadium (formerly Qualcomm) and catch the trolley. MTS has 5,000 free parking spots and will boost service to every 7.5 minutes beginning at 8 a.m.! Also, the Compass Cloud mobile ticketing app is the fastest option to get Trolley passes in advance. Exit at the County Center/Little Italy Station. All Women’s March Trolley service info can be found here. 3. COASTER BUS SERVICE: Limited non-stop bus service will be available directly to the Old Town San Diego station from Oceanside Transit Center, Carlsbad Village, Carlsbad Poinsettia, Encinitas, Solana Beach, and Sorrento Valley stations. All buses will depart from each station at 8:00 a.m. In the afternoon, buses will depart Old Town San Diego station at the following times, based on the station destination: Sorrento Valley 2:30 p.m., Solana Beach 2:35 p.m., Encinitas 2:40 p.m., Carlsbad Poinsettia 2:45 p.m., Carlsbad Village 2:50 p.m., and Oceanside 2:50 p.m. Click here for more information. 5. HOP ON A RALLY BUS: As long as 30 or more people sign-up for a bus, it will run. Prices start at $30 round trip. Rally Bus organizes buses based on demand, so spread the word and help get those seats filled! 6. PARK AT SAN DIEGO HIGH SCHOOL 1405 Park Blvd, San Diego, CA 92101. 150 Parking Spots, $10. Proceeds will support the high school's music program! 7. PARK DOWNTOWN: Search for and reserve parking in downtown San Diego. 8. LYFT: Existing Customers: 30% off to and from the Women's March San Diego with code WMSD2018. Maximum savings of $5 per ride. Discount applies to fare and Prime Time charges only. New Customers: $5 off with code HearOurVote. IMPORTANT: March starts and ends in Waterfront Park. N. Harbor Drive & Pacific Highway will be closed to traffic 8:00 am - 1:00 pm. Lyft/Uber/Chartered Bus Drop-off: Beech St. and Ash St. between Columbia & Front St.
Women's March San Diego believes all marchers matter. If you are not able to march this Saturday due to disability, consider joining a virtual march at disabilitymarch2.com. We look forward to another peaceful and safe march this year! Women's March San Diego is working with multiple public safety organizations, who will be providing the maximum number of resources. Afterwards, please consider marching over to Little Italy's Loading Dock, The Local Eatery and Drinking Hole, or Kettner Exchange. These fine establishments are donating a portion of their proceeds to Women's March San Diego! Please join Women's March San Diego, in actively supporting this event, to honor the bold and brave women of San Diego who are driving the progressive agenda forward and leading us toward a brighter future. How can you help in the wake of the mass shooting in Las Vegas? There has been a request for blood donations, and the American Red Cross offers guidance on local sites to donate blood in time of need. No matter where you are, please consider heading over to your local blood centers to donate! There is always a need! The White House is planning to announce their decision regarding DACA on Tuesday, Sept. 5th. In response, we will rally in support of DACA recipients and our immigrant community! The program will be led by DACA recipients and Legal/Academic experts, with performances to lift spirits. In partnership with the Women's Museum of California, celebrate Women's Equality Day! Don your suffrage hat and long skirt, and wave your women equality signs to join the rally and parade! There has never been a clearer sign that we must continue what we started with the Women's March than what happened in Charlottesville. The line has been jackhammered into the concrete. Women's March San Diego is standing in solidarity with Together We Will: Indivisible San Diego for Charlottesville. Join us. Condemn disgusting white supremacy and neo-Nazism. Honor those who fight against. BRING SIGNS AND CANDLES. We are asking people to promote good relations between all peoples. Our strategy is to use non-violence to counter the message of hate groups and to publicly express our support for the victims of crime in Charlottesville. Please be part of our strength! We call for a strong and decisive stand against racism, oppression, and white supremacy in all its forms. The violence we have witnessed in the past 48 hours in the small college town of Charlottesville, VA is simply another chapter in a long legacy of hate in America. With one voice, we demand it to stop! PLEASE WEAR YOUR WOMEN'S MARCH TSHIRTS IF YOU HAVE ONE! SDPD will be there to support our vigil! In support of a woman's right to choose. Please join us for this important counter protest at Planned Parenthood (Clinic on 1st Ave.). On Sunday, July 2nd, we march to demand Congress DO THEIR JOB and remove Trump from The White House. Donald Trump’s extreme disregard for the Constitution is a profound subversion of the Office of the President. We demand that Congress does its job and commences with impeachment proceedings immediately. We demand that Congress stop enabling President Trump through an embarrassing and potentially catastrophic charade of normalcy. As Republicans plan to vote on a health care bill that they won’t even allow the public to see, one that reportedly will take away pre-existing condition protections for tens of millions of Americans, there are reports they feel emboldened to do so now because calls to the Senate regarding the ACA and the AHCA have dwindled to normal call levels, after the unprecedented deluge of calls around Trump’s inauguration. Every single senator has a legislative assistant dedicated to health care. It is time for all hands on deck. These legislative assistants need to hear directly from you. Be precise, be polite, make your voice heard. There will also be a march in North San Diego County. Tickets for the event were sold out in advance...to Issa supporters, and registration is currently at capacity. Please add your name to the waitlist to be notified if new spaces become available from cancellations. Peaceful protest anticipated outside entrance. Please join us for the San Diego Moms Demand Action Orange Walk in recognition of National Gun Violence Awareness Day. Go over the San Diego/Coronado bridge. Make 2 rights to enter the park. Park and walk toward the playground. Join us on the grass to the right of the playground.